My very first furniture project became obvious when my wife was fed up with our seven years old stacking his dress-up costumes in every corner of the house. 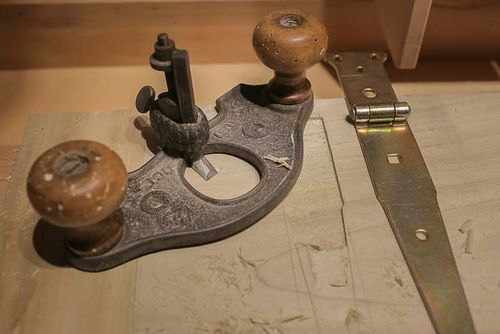 Being raised in a classic French house full of antique furniture, I was always surrounded by dovetails, so a dress-up dovetailed chest it will be! With a full time job and still setting up the workshop/basic tool set at the same time, it was really a lengthy project. 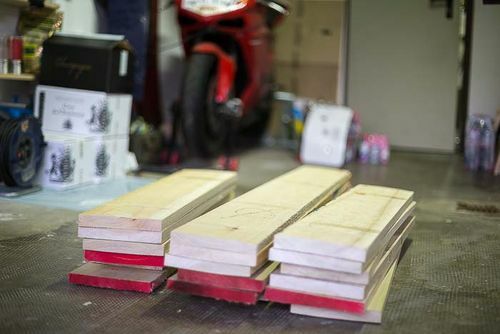 I was quite confident on the technical part but I still thought it would be wise to choose a cheap wood for a first project. 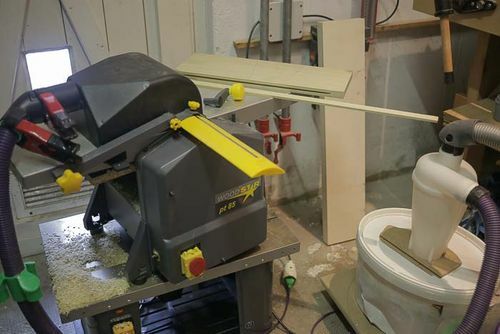 I bought my first lot of poplar and milled part of it at a nearby school. For a small fee, I could have access to their top-notch machines and benefit from advices from the teacher. 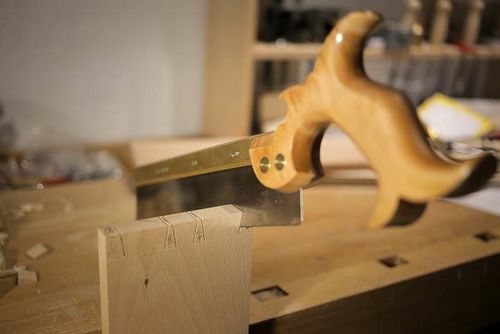 Back in my tiny workshop I could take my time and have fun cutting my dovetails…nothing scary as I trained a tad before, bought appropriate tools and learned to sharpen them. I worked without plans, with some rough ideas in mind but in the last minute I changed my mind on the lid structure, and decided to go from a simple tongue and groove all the way to a tongue and groove with breadboard ends. Ho my! 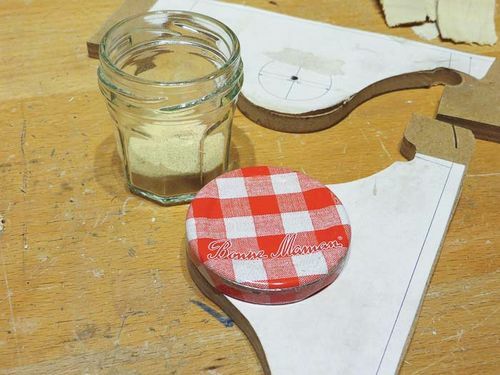 Fitting square pegs into round holes was definitely the peak of stress from the project. As I did not read too much about it, I tried to do a mix of common sense and experiments and I managed not to break anything, but that was a truly frightening moment. As a keen black and white photographer for 25 years I have a lot of material transferred on external hard drives, and I am always a bit scared of the inexpensive but so valuable hard drives stolen during a break in. I then took the opportunity to accommodate two secret compartments on the sides of the drawer. 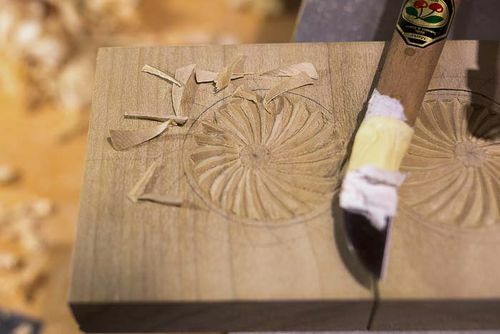 I come from the Alps and I thought it was a good opportunity to experiment traditional chip carving on two off centred drawers stops. These can be turned to slide out the drawer fully in order to access the hidden compartments. I can now store four 3.5” HDD in there. The finish is golden oak stain and a semi-gloss varnish, both water based. I found out how much of a pain can be staining the wood, and I will from now on, avoid this at all cost. It would be underrated to say that I learnt a lot in the process, but as I played and experimented with the tools on small projects before, this first furniture came smooth. It’s been more than a year I finished it and nothing moved so far. 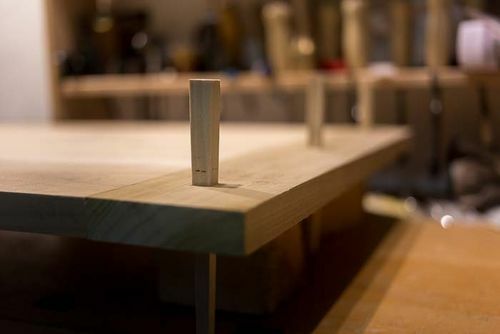 My biggest failure, probably common for a newbie, was to concentrate on the technics to joint the wood, while I was lacking on the wood knowledge itself. I kept the best wood to make the box, and I ended up with the ugliest wood left for the lid, which is the most visible part. …maybe it was a wise thing to choose cheap wood after all ! Many thanks for reading my broken English, and thanks again for the inspiration! This is a very nice looking chest. Well done. I am not sure I understand where or how you made the secret access, but it looks great. This is a very nice piece and it shows a lot of wonderful workmanship. Thanks everybody for your nice comments, this kind of support is valued when one begins in the hobby! For Swirt, I apologize, my explanations were not clear. The side of the drawer runners are not the full height of the drawer, only a bit more than half of it. That way I can access the space between the drawer and the side of the chest, which would be dead/empty space otherwise. I added a floor to this space. Turning the drawer stop allows to completely pull the drawer away and access these two compartments. I hope this helps.